The rebooted Inquest into the Hillsborough Disaster has at least finally produced a verdict that tallies with what really happened. Considerable new information was unveiled during the proceedings, adding to public understanding. But there is much about the tragedy, both before and after, that still requires accounting for, and the South Yorkshire Police Service, with its delaying tactics throughout, made clear it has no wish to help with them. The police priority ultimately remained, as it has always been, to shift responsibility onto others, and so mysteries about the Disaster that should have been resolved long before now remain mysteries. Perhaps this is as much an exercise in curiosity as it is in articulating the ongoing quest for justice (no, an Unlawful Killing verdict in a Coroner’s court does not constitute justice in itself), but I have decided to offer up some questions that I was hoping the authorities might answer at the Inquest. To the best of my knowledge, they have still not been answered after twenty-seven years, and as they are important and relevant issues, truth, justice and accountability will require explanations for all of them – and much else besides. 1) Who in the South Yorkshire Police decided to appoint David Duckenfield to be Match Commander at an FA Cup semi-final, when it was so patently obvious that he was ill-equipped for such a complex role, and why? Much has rightly been made down the years of the then-newly-promoted Chief Superintendent David Duckenfield being horrendously inexperienced and ill-prepared for the job of directing the police operation at Hillsborough. This lack of know-how certainly explains why Duckenfield made such a dreadful hash of the role, and arguably one can even feel just a tiny, rare twinge of sympathy for him as a result of the position in which he was placed. But in turn, no one has yet properly explained why he was given such a glaringly-unsuitable role in the first place. The Hillsborough Independent Panel, in their Report in 2012, explicitly stated that they could find no documentation at all in South Yorkshire Police files explaining the thinking behind the appointment. I was therefore hoping that someone might ‘de-cloak’ that subject a little during the Inquest. It never really happened though, and Duckenfield himself was, characteristically, of little help on the subject. The late Peter Wright, Chief Constable of South Yorkshire in 1989, stated nearly a week after the Disaster that he accepted ‘full responsibility’ for the actions of the police at Hillsborough due to them being his own appointments. But in the 22 years that followed before his death, Wright never gave any coherent explanation for the most critical appointment of all. Surely there is still someone alive who was in the South Yorkshire Police at the time who can at least shed a little light on this? It is a very important matter, as it raises serious questions about the adequacy of the processes by which roles are assigned in the South Yorkshire Police, perhaps even in the British Police as a whole. What process did Wright follow that led him to choose Duckenfield? Was it just laziness? Did he just assume that, now Duckenfield was the same rank as his predecessor, Brian Mole, he would automatically be able to do all of the same jobs to the same standard? Was it, as some suspect, because Duckenfield was a freemason, and ‘fellow travellers’ high up in the police hierarchy were giving him an easy climb? It is possible that selection processes have changed in the long years since the Disaster of course, but rather than just complacently acknowledging the possibility, I for one would be a lot happier if we made sure. Especially so, given the, frankly, comical aftermath of the recent Inquest verdict; soon-to-retire Chief Constable David Crompton was suspended due to police conduct during the Inquest, and Dawn Copley, an officer under investigation for possible corruption (no, this is not a joke, at least not an intentional one), was appointed to fill in for him until a permanent successor could be found. Hardly surprisingly, she lasted little more than twenty-four hours in the position before a new public outcry chased her from office. This little chapter has more than a faint echo of Duckenfield’s ill-considered appointment, in that whoever is making these decisions in South Yorkshire still does not appear to be checking very carefully or thinking through the implications very far. The country really does need to know, and, where appropriate, to demand substantial changes to selection processes. 2) Having stated in advance that the Taylor Inquiry would ‘undoubtedly reveal the true nature and cause’ of the Disaster, why did the South Yorkshire Police higher echelons so aggressively attempt to ‘un-write’ the Taylor Interim Report during the Coroner’s Inquest, instead of just accepting its findings? Chief Constable Peter Wright was unequivocal in the days after the Disaster in his confidence that the Taylor Inquiry would successfully get to the root of what went wrong at Hillsborough. This surely can only be interpreted as a commitment to accept Taylor’s quality-of-judgement and impartiality, and so to respect whatever findings at which he might arrive. In the event, the Taylor Interim Report concluded that the police were the hapless creators of the Disaster, and in response, Wright offered his resignation. But the then-Prime Minister, Margaret Thatcher, was unhappy at Taylor’s ‘devastating criticism of the police’. While not formally rejecting the findings, nor actively participating in the renewed cover-up that followed, Thatcher refused to offer any public endorsement of the Taylor Report, and that made it very easy for the authorities in South Yorkshire to reject Wright’s resignation. From that point on, the force became very aggressive in disputing and trying to discredit Taylor’s findings, especially in the original Coroner’s Inquest. This was in flat contradiction of Wright’s original declaration. Wright himself gave a very irresponsible interview to the Sheffield Star in February 1990, in which he explicitly dismissed the Interim Report. These sorts of articles were prominent in the South Yorkshire media around this time, and showed that the police were manipulating their contacts in the press in a way that was liable to have an unfair influence on the locally-selected jury at the Coroner’s Inquest. Lord Justice Taylor had gone from being a man in whom Wright had confidence to being a man Wright was determined to discredit. There must be someone who was in the command structure of the South Yorkshire Police at that time who can account for such a stark reversal-of-position. As matters stand, the likeliest and most tempting explanation by far is that Wright had originally just assumed that Taylor would hand his force a ‘Get-Out-Of-Jail-Free card’ and whitewash the Inquiry, hence the prior endorsement. Having instead carried out a genuine investigation, Taylor came to a conclusion that Wright had not wanted, and so higher-ups in the South Yorkshire Police decided they were not as confident in him as they had previously sounded. It is worth noting that, in the aftermath of the original Coroner’s Inquest, when campaigners disputed the verdict of Accidental Death, the loathsome Paul Middup of the South Yorkshire Police Federation (the police ‘trade union’) publicly, and with characteristic tactlessness and accusatory wording, suggested that they did not really want justice. Setting aside the cheap insult implied in that final sentence, and Middup’s utterly mysterious definition of ‘having justice’, the barefaced hypocrisy of his words beggars belief. He effectively accuses Hillsborough campaigners of ‘sour grapes’, as though they were upset about a refereeing decision in a football match instead of grieving the deaths of loved ones. He berates their refusal to accept the judge’s verdict as final. And yet he and his own police force had done exactly the same in response to the Taylor Interim Report’s findings, and based on far less evidence than the objections of Hillsborough campaigners to the Inquest verdict. Quite simply, if the police declared that the Taylor Inquiry would ‘undoubtedly’ find the truth, and if they are going to imply that rejection of the original Inquest verdict is spiteful behaviour, then they are clearly going to have to explain how their own change of stance is any less spiteful – or admit that they should have kept their promise in the first place. 3) David Duckenfield’s predecessor, Chief Superintendent Brian Mole, offered to come back to Hillsborough for the semi-final to serve as Match Commander. Given Duckenfield’s comparative inadequacy in the command role, why was Mole’s offer refused? Chief Superintendent Brian Mole was moved from Sheffield to Barnsley just three weeks prior to the FA Cup semi-final, due to a very cruel prank played by some of his officers on one of their colleagues. It was a prank that Mole had had nothing to do with, and had it not happened, it is fair to suggest that the Disaster would have been avoided, as the police effort at Hillsborough would have had experienced leadership. But whether the rumour is true or not, there is evidence to indicate that Mole himself did offer to attend the semi-final as Match Commander. For reasons that have never been made particularly clear, Duckenfield declined. He did apparently counter-propose that Mole attend the match in an advisory role, but Mole, perhaps worried that his advice might be ignored but that he could still become implicated in anything that might go wrong, was not keen on that suggestion. NOTE: The precise order of these events is not clear, and so we do not know for sure which offer was made first. But whatever the case, there seems no doubt that Mole did offer to perform the Match Commander duties, and that Duckenfield said no. It could even be argued that it was a generous offer by Mole, given that he was offering to give up a day off to make sure that one of the toughest jobs on the South Yorkshire Police’s calendar was kept in experienced hands, despite the fact he had recently been demoted by the force for horseplay that he had not been involved in at all. We cannot ask Mole, as he is no longer with us, but we really do need to know why Duckenfield turned down such an eminently sensible suggestion. Were it a matter of ego for instance – say Duckenfield felt insecure in his new position as Chief Superintendent and so wanted to ‘prove his manhood’ as it were – it is important we make sure that the police in future do not treat their jobs as vehicles for their own self-esteem. 4) Why did the Football Association never, as a matter of policy, check the safety certificates of stadia considered for FA Cup semi-final venues, even after such stadia had undergone very public modifications? It is a well-recorded concern of the Hillsborough Disaster that, it emerged during the Inquiries that followed, the safety certificate for the stadium was eight years out-of-date by 1989. The certificate in effect at the time reflected the stadium’s lay-out as it was from the date-of-issue in 1979 through to the summer of 1981. A wide variety of changes were made to the stadium in the years that followed, especially on the Leppings Lane terrace, all of which required an assessment and corresponding update to the certificate. But no re-assessment was performed. Even the official terrace capacity of ten thousand one hundred – considered by the police to be an over-estimate from the outset – was not re-calculated. Further changes were made in the years ahead, including installation, removal, or re-positioning of crush barriers. All of these needed assessing to make sure that the new lay-outs did not jeopardise safety of spectators, and to make sure that the barriers were well-connected to the terrace floor, set at good heights, and were in a strong enough condition. But again, no such assessment was carried out. A roof was put on the ‘Spion Kop’ stand at the east end of the stadium. The Leppings Lane terrace was re-divided into five pens in 1985. The entry concourse at the west end of the stadium was divided up by a complex series of diagonal walls, to help with segregation. All of these were major changes that would have serious implications for safety and evacuation, and yet not one re-assessment was performed. When the Football Association was mulling over whether or not to award Hillsborough an FA Cup semi-final in 1987, you might imagine that the first question they would have asked would be, “All these changes the club has made to the stadium, are we sure they are safe?” There had been no semi-final held there in six years, after thirty-eight Tottenham Hotspur fans were injured in a crush on the Leppings Lane terrace in 1981. On reflection of that, you might expect safety considerations to be the first priority for the FA when weighing up the decision. And you would be quite wrong. Titcombe may not realise it, but this remark is frightening in the extreme. On one level, he is correct, safety certainly was a responsibility principally of the club, local authorities, and police. But if the Football Association – the body governing the sport in England and running the FA Cup competition itself – refused to have anything to do with safety matters at all, that would mean it would not even accept the duty of enforcing safety rules, the job of making sure clubs were complying with them. And if the FA was refusing to do that, that would mean nobody was. How effective could the safety laws introduced in the 1970’s be if no official body or individual was making sure that they were being carried out? They were reduced to text in books, no more effective at laying down the law than a Qur’an in a Christian country. So why was the FA taking such a remote stance that its people would not even pause to check safety documentation? Disinterest? Fear? Lazy concern that to do so would imply acceptance of responsibility? In the absence of a clear answer from the FA, the only reasons I can think of are all overwhelmingly negative ones, suggesting an authority that cared nothing for its own supporters. Given it was routinely accepting money from them, that in itself could constitute criminal negligence, possibly even a form of fraud. Unless the Association can come up with a genuinely good explanation for this ‘steer-clear-of-safety-issues’ policy – and by ‘good’ I mean an explanation that does not boil down to evading responsibility – it will have members past and present in the dock alongside the South Yorkshire Police when criminal prosecutions begin. 5) Chief Constable Peter Wright admitted on the BBC’s Match Of The Day, just hours after the Disaster, that the number of people on the Leppings Lane terrace did not appear to exceed its capacity, making wide ticketlessness a remote possibility at best. So why over the next few days did he order his force to find evidence that would place the blame on ‘drunken, ticketless individuals’? That instruction heavily shaped the South Yorkshire Police’s conduct in relation to the Disaster over the next several years, even though subsequent analysis by the Health & Safety Executive found that the attendance was indeed very close to the ticket allocation. One cannot help but imagine Wright putting his hand over his own mouth after the interview with Sinstadt and muttering, “Damn, why did I say that?” as it potentially undermined his force’s later efforts to shift blame for the Disaster onto the Liverpool supporters. Wright’s observation that the ground was not over capacity was clearly inconvenient to those efforts, and he was therefore perhaps fortunate that no one in the media noticed the inconsistency and took him to task over it. It is notable that, during the 19th April meeting mentioned above, Wright was told a variety of tall stories about fan behaviour by his officers. He seems to have gone along with them out of sheer convenience; it is quite impossible to see any honourable rationale, as matters stand, for Wright’s speedy change-of-stance. The only plausible explanation is that a narrative about ticketlessness suited his defence, while his earlier observation of the physical facts did not. For the posterity of the late Peter Wright, maybe one of his former colleagues can shed light on other, presently-unclear reasons why he did it? If not, he will be forever remembered as a toxic liar. 6) What possible reason did the Coroner of South Yorkshire West, Dr Stefan Popper, have for taking blood alcohol levels from children? One of the most notorious actions carried out by the authorities on the night after the Disaster was done on the orders of the Coroner, Dr Stefan Popper. Blood samples were taken from all ninety-four fatalities, as the total was at that point, and tested for alcohol levels. Nonetheless, the instruction might be seen as at least comprehensible in most cases. The truly disturbing and unsettling aspect of the instruction was that it was completely indiscriminate. All of the victims were tested for their blood alcohol levels, including children. The youngest of the victims, Jon-Paul Gilhooley – cousin of the future Liverpool captain Steven Gerrard – was just ten years old, and even he was tested for blood alcohol levels! This does not suggest a very objective mindset on the part of Stefan Popper. He clearly saw football fans in an ugly, yobbish light, which is a distorting enough prejudice. But to extend that to the point that he assumed any football fan with an age in double-digits is a candidate to be a heavy drinker is beyond insulting. Even if Gilhooley, by some incredibly remote happenstance, genuinely had had a drop of something inappropriate added to his lemonade, it is still hard to see how it would be relevant, for a reason that should have crossed Popper’s mind; drink or no drink, how much pressure can really be added to a human crush of several thousand adults by a boy whose number of years on Earth probably exceeded the number of stones he weighed? The instruction, at least without getting permission from the next-of-kin, was insulting and invasive, but extending it to children was also pointless. It caused completely unnecessary extra distress to bereaved families, who, if nothing else, could have at least been spared that. So Popper, who died just weeks before the new Inquest verdict, was guilty of gross insensitivity and impropriety. If anyone who worked closely with him on the night of Hillsborough is still alive, they really need to explain what the blazes he was thinking. 7) Various officers in the South Yorkshire Police repeatedly told bereaved relatives of the dead that the deceased were “now the property of the Coroner”. Who was responsible for choosing such incredibly crass, almost-bullying wording? The often-mentioned experience of the bereaved families of Hillsborough on the night after the Disaster of the South Yorkshire Police treating them like criminals remains one of the most shameful aspects of the Disaster’s aftermath. When traumatised survivors and relatives most needed understanding and support, they were herded around Sheffield like sheep, interrogated crudely and accusingly about alcohol-consumption, forced to identify the dead by a hugely insensitive and undignified photographic process, and refused leave even to make any physical contact with their lost loved ones. I have been aware of the stories of that night for well over twenty years, and even now, as I am typing that very quotation, still I struggle to comprehend it, still I struggle to picture such astonishing lack of human feeling when talking to people who are in a state of shock and grief. Referring to the dead as anyone’s ‘property’ is utterly dehumanising, as I say, but the subtext of what the police were saying was even worse; it suggested that the bond between the dead and their families had been severed, and all rights surrendered with it. It was authoritarianism, not public service, and it is beyond doubt that this mistreatment severely and irrevocably disrupted the grieving process for many of the families. Now, as so many of the officers used that exact same terminology, literally verbatim, we can safely assume they were ordered to use it any time one of the bereaved started asking awkward questions. What we need to know is which particular police officer gave that instruction, and what possible reason they could offer to justify the use of such insensitive wording. 8) The FA received over a hundred letters of complaint from Liverpool supporters after the 1988 semi-final, warning that the Leppings Lane terrace was very dangerous; why did the FA not reply to the letters, or apparently not take them into consideration when selecting the semi-final venue for the following year? It is unclear who was responsible at the FA for dealing with correspondence in the late-1980’s, but one thing that is known is that Liverpool supporters had such a horrible experience on the Leppings Lane terrace at the FA Cup semi-final in 1988 that the FA received a deluge of letters of complaint. …it was impossible to move sideways as the momentum of the crowd continued to push us forward. We were forced to duck under metal barriers or suffer even more crushing. Finally we were forced right up against the barriers which prevent the fans from getting on to the pitch. During the match we had to constantly bear the crushing force of the crowd swaying forward from behind. It would not have been so bad if we had been able to move sideways, away from this central part, but it was so packed, and the constant pushing, jostling and surging of the fans made this prospect appear even more dangerous. During the game some fans actually collapsed or fainted and were passed over peoples [sic] heads towards the front of this section of the ground. There is no indication of anyone within the Association responding to any of the one-hundred-plus letters, nor of anyone taking the details revealed in the letters into account before deciding whether to award Hillsborough a third successive semi-final in 1989. The aforementioned Adrian Titcombe described the selection process in depressingly casual terms, when asked at the Inquest. He said that the selection committee in 1989 spent “not more than ten minutes” debating before deciding to award another semi-final to Hillsborough. This memo appears to have been honestly believed by whoever wrote it; as it was only meant for internal eyes at the FA, why would they bother to lie? But for the writer of the memo to believe such a reversal of the plain facts would mean that there must have been a number of people at the FA who had not been made aware of the correspondence warning of the dangers on the Leppings Lane terrace. How was it not a regular, serious and Association-wide subject of discussion, given the size of the occasion, the degree of hazard revealed, and the terrace’s dangerous history of ‘near misses’? Who at the FA first read these letters, and what did he or she do with them? Did he or she tell anybody in authority about them, and if they did, what did the person in authority do? Above all, how does the FA deal with letters-of-complaint today? Does it respond by investigating the complaints and making its findings known? Or does it quietly file the letters away and pretend not to have received them? Once more, we have to know if there are lingering failings that need fixing. 9) Why did Sheffield Wednesday Football Club have no record of the age of crush barriers at the Hillsborough Stadium, and how was the corrosion on the barrier that collapsed repeatedly missed? (For a more detailed discussion of this issue, please click here.) One of the crush barriers in pen 3, designated barrier 124a, collapsed during the crush, causing scores of people to go to ground in a giant pile-up, substantially adding to the death-toll. 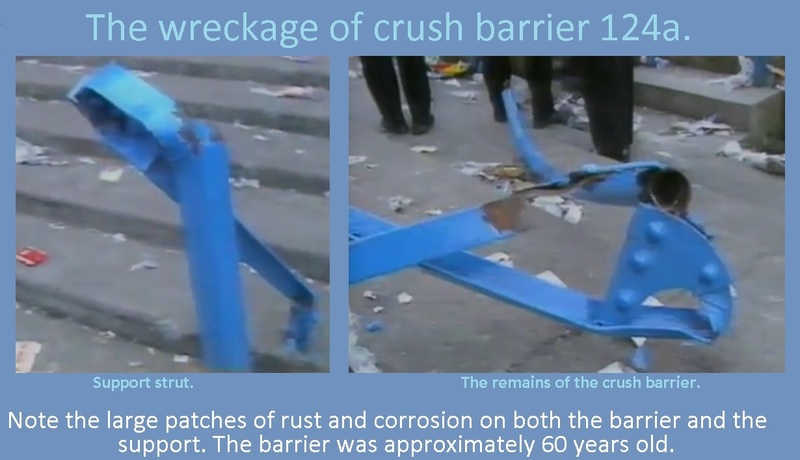 Subsequent analysis of the barrier’s wreckage revealed significant corrosion on the joint connecting it to the terrace floor, and large amounts of old litter that had been disposed of inside the barrier-pole down the years. One item of litter was particularly worrisome – a page from a newspaper, The Yorkshire Telegraph and Star, dated 24th October 1931. It was therefore printed roughly fifty-eight years before the Disaster, and on balance, it would seem to indicate that the barrier in which it was ‘binned’ was probably even older. There is no hard-and-fast rule on how long a crush barrier’s serviceable lifespan should be, but as a ballpark figure, twenty years is probably the point after which it becomes risky to keep using the same one. Sixty years, or thereabouts, is clearly well beyond any reasonable expectation of it being fit-for-purpose. Sure enough, the heavy rust and corrosion damage found below the thirteen coats of paint (a number of coats again implying extreme age) was enough to suggest that 124a should probably have been replaced by around 1955. Instead, it was still in full use in 1989. Eastwood & Partners, the safety engineers, claimed in the days after the crush that tests were carried out on crush barriers routinely every year. But if that were the case, how did both E&P and Sheffield Wednesday Football Club manage to keep missing the corrosion on barrier 124a? Inspection by the Health & Safety Executive found that some of the corrosion was visible to the naked eye. Further, Sheffield Wednesday Football Club’s documentation shows no apparent record of the age of any of the crush barriers used at Hillsborough. Why not? Was it a calamitous oversight? Was it just naivety, a silly assumption that a crush barrier had an unlimited lifespan? Or was it something more sinister? For instance, was corrosion damage deliberately painted over to hide it, in order to avoid the cost of replacing old and worn-out facilities? Any of the above explanations would be grounds for criminal charges. Or is there a more reasonable explanation? Once again, it would be good for the club’s posterity if it can offer one, as this is yet another question that invites seedier explanations the longer it remains unanswered. 10) Why were South Yorkshire Police officers instructed in the hours after the crush not to write any details of what they had seen in their pocketbooks? Whether South Yorkshire Police behaviour after the Hillsborough Disaster was explicitly illegal, we shall only know for sure in the months ahead. What is quite beyond doubt though is that an awful lot of it was deeply irregular, and one of the ‘quirks’ that continues to cause great concern among Hillsborough campaigners and researchers to this day is an instruction given to officers within a couple of hours of the crush. This may not sound like a big deal to the man-in-the-street, hardly more than a bureaucratic nicety. In fact, this was an absolutely extraordinary instruction, and seems to imply a determination, even at this early stage, for absolute control-of-message by senior officers within the South Yorkshire Police. In itself, the policeman’s pocketbook is a vital ‘tool’ for gathering observations made by officers on duty, which makes this instruction bewildering enough. But what makes it thoroughly startling is the reference to the Disaster Log; how could the chief inspector, or any police officer in authority that day, possibly know what details to put in the Disaster Log without the observations noted down by officers in their pocketbooks? Without the observations of officers to inform the Log, it would become an exercise in Creative Writing, just making up a largely-imagined version of events. Maybe that was the whole point though? As a police pocketbook is state property, any notes taken in it cannot simply be ‘hidden’, ‘buried’ or altered. One way of getting the Disaster Log to say what senior officers wanted it to say would of course be to make sure there were no other police records available to contradict it. Such as those normally written in pocketbooks by officers. That is the most obvious, most plausible explanation for why this incredibly irregular order was given. If it is not correct, I for one will be very willing to hear the South Yorkshire Police’s ‘real‘ explanation for it. We have, after all, been waiting for it for the better part of thirty years, and no one is stopping them from revealing it. I would further hope that stricter and clearer guidelines on the ‘sovereignty’ (for want of a better word) of police pocketbooks on duty can be introduced, to make sure no senior police officer can just casually pick-and-choose when they should be employed. I need to stress that this list is by no means comprehensive, nor are the questions intended to be seen as a ‘definitive top ten’. There are many other questions that still need to be answered for full accountability to be achieved, and some campaigners may well feel that other ones are more important. I have simply listed the ten questions that I find most pressing. (If you have others to contribute, feel free to submit them in the comments section below.) I would say that until these questions and others are answered, justice and accountability will remain incomplete, as will the lessons to be learned for the future. With criminal investigations such as Operation: Resolve and the Independent Police Complaints Commission’s investigation into the conduct of the South Yorkshire and West Midlands Police forces, there is much still to be revealed in the months ahead. But if the above questions are not all answered, I for one will feel that the investigations have not really completed their work. The original Coroner’s Inquest into the Hillsborough Disaster between 1989 and 1991 was the longest in English history. Since quashed, it has been superseded by the ‘rebooted’ proceedings that ended this week with a landmark verdict of ‘Unlawful killing’. The rebooted Inquest began in March 2014, and ended in the dying embers of April 2016. In other words, the process lasted rather longer than two years. Years. Over two of them. Twenty-five months, it took. Keep that span of time in your mind as you read on, and imagine two years of discussions of any subject you care to think of. Just picture how much information you could convey and receive in two years of constant discussion of the same topic. Now, simple-minded resistance to the verdict was entirely predictable from some quarters, and in the case of fans of rival football clubs wanting to reinforce their own prejudices against Liverpool supporters, it was equally predictable that it would be based on, yet again, regurgitating long-discredited myths about the disaster’s causes. As I say, I really expected no better, especially from more extreme Mancunians. I know that the desire to protect one’s own prejudices can be very seductive, but it leads to no practical advantage, so please, stop being obtuse, and apply a little critical reasoning. Of course the old myths about Liverpool fan behaviour were mentioned in the rebooted Inquest, all of them, even the truly preposterous idea about a fan ‘conspiracy’ to force the police to open the gates was given voice more than once. Representatives of the South Yorkshire Police, past and present, made damn sure that all of these smears were re-asserted and used to drag the process of the Inquest out months longer than it should have lasted. This is one of the key complaints of Andy Burnham MP’s outstanding speech to the House of Commons this week, that the tactics of the police lawyers throughout the Inquest served only to prolong the agony and reopen old wounds of survivors and the bereaved for the umpteenth time. The first few months of the Inquest in particular were bogged down in constant, long-discredited assertions of heavy drinking. This utterly undignified show of stubbornness forced the proceedings to waste time re-examining the evidence that had long ago established that very few fans had been drinking heavily at all. Really, how much of a deliberate fool would you have to be to imagine that these notions were ‘kept’ from an Inquest at which the very people who had originally circulated them had lawyers present? There were hardly any ticketless fans. A count by the Health & Safety Executive of people entering the terrace established that back in 1989. There was very little drunkenness at all. No blood analysis of victims, survivors or the dead, showed up abnormally high levels of alcohol, no pictures or CCTV footage showed any evidence of widescale drunken behaviour, very little litter was found of the alcohol-packaging variety. Pressure on the turnstiles was not caused by constant pushing. It was caused by there simply not being enough turnstiles allocated to the Liverpool supporters, all of the ones they had being in a narrow concourse with very little room, and extremely poor guidance provided by the police. Every last one of these old myths was checked during the Inquest, and all of them were dismissed as implausible, and/or of simply leaving no evidence where there would have been some. At best, they were guesses, at worst, they were malicious rumours. Now, as I say, it is entirely predictable that some people would respond to the Inquest verdict in this utterly brainless way, but it actually became frightening before the weekend due to a man called David Sumner. Sumner is a retired ex-chief inspector in the South Yorkshire Police, and in an interview with ITV News, he has done exactly the same thing as the laymen mentioned above. He has rejected the findings of the Inquest, entirely on the basis of one of the discredited myths. I don’t really agree… that the Liverpool supporters were completely innocent because they weren’t – there’s no doubt about it. There was a minority – and a large number in that minority – who seem to be able to think they can go when they like and do what they like… They’ve all been asked to be in the ground 15 minutes before kick-off at the very latest. Why didn’t they do that? This bottleneck had caused serious problems at two previous semi-finals held there. One in 1981 when it led to a serious crush involving Tottenham Hotspur fans, thirty-eight of whom suffered injuries, the other in 1987, when the kick-off had to be delayed due to Leeds United fans being unable to get in in time. Add to that the problem of roadworks on the M62 and on the outskirts of Sheffield slowing down the traffic, and it is hardly surprising that, by 2:50pm, there were still several thousand Liverpool supporters trying to get in. It was calculated by the HSE that it would have taken until 3:40pm, due to the slow ‘through-put’ of the turnstiles, to get everybody into the ground. Why I describe Sumner’s words as ‘frightening’ though is that he was on duty at Hillsborough on the day of the tragedy, and yet, after twenty-seven years, he still appears to be blissfully unaware of the bottleneck. How can he not have cottoned onto this crucial detail after all these years? It was mentioned not only by Lord Justice Taylor, but also during the original Coroner’s Inquest, by the Stuart-Smith Scrutiny of Evidence in 1998, by the Report of the Hillsborough Independent Panel in 2012, and in considerable detail by the new Inquest. And not once did he notice? This is doubly scary when one considers that, as members of the police with the responsibility for directing the crowd on the day, Sumner and his colleagues all needed to be aware of that bottleneck beforehand. That he remains ignorant of it twenty-seven years later suggests that, for a man in a role that requires detective skills, he has very poor attention-to-detail in general. But more pertinently, that he was unaware of it at the time emphasises just how appalling a job the South Yorkshire Police did on the day of the disaster, just how wretchedly ill-prepared they were, and how sketchy their knowledge of the stadium was. How can one safely direct a crowd into a stadium without knowing its shortcomings oneself? Not having that knowledge before taking the job on can only be seen as negligence. Therefore, paradoxically, Sumner’s words only confirm that the Inquest jury’s verdict is correct. The ninety-six victims of Hillsborough were unlawfully killed by an amateurish and lazily-prepared police force trying to direct them into a known unsafe stadium.